It’s a Sunday afternoon, you light a candle, hop into the bath, and then envelope yourself in deliciously smooth body oil! That sounds like a perfect weekend afternoon to me, no? It’s even cooler when it’s the candle that creates the body oil for you! I’m talking about my newest obsession from The Sitota Collection. Sitota uses all natural coconut wax, shea butter, soy oil, and essential oil blends like jasmin, sandalwood, and vanilla. I’ll admit, when I first smelled the candle it had a headier, earthier smell to me. However, when I burned it and when I used the melted body oils, the smell became very pleasant and relaxing! The wax never got too hot, and I was able to scoop it out gently with my fingers. 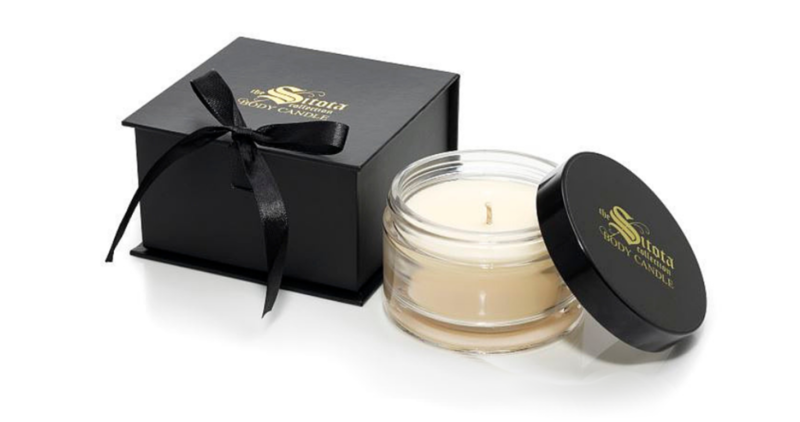 I had to re-light the Sitota collection body candle a few times throughout my use because I wanted to make sure the wax wouldn’t get too hot, but it really never did! Somehow Sitota has made an awesome wax blend that somehow maintains a great, safe temperature that burns clean for over 35 hours. And did I mention the sleek packaging? After use, my skin felt so smooth and supple! The essential oil and wax blend along with aloe made my skin feel truly rejuvenated. This is a must-have for anyone who needs a total body moisture boost. And, with winter less than six months away on the east coast, this is going to be a regular product for me after a long day of shoveling snow. Try it out, it will make you “melt” without a doubt!